The young, orphan protagonist of "My Life as a Zucchini." 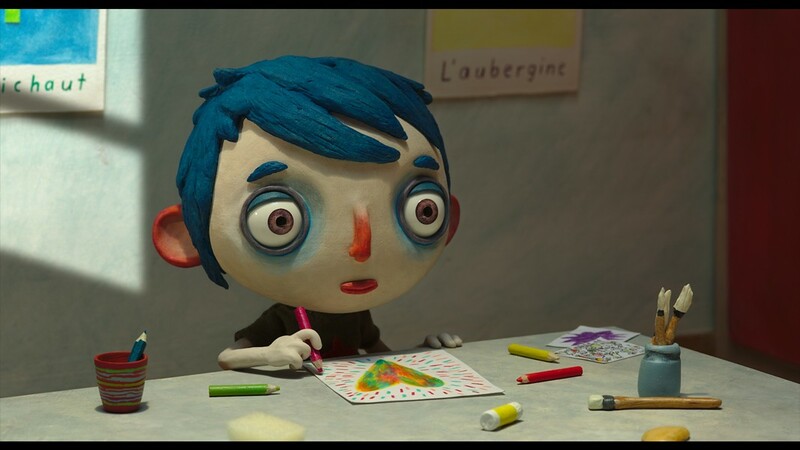 Dark emotional terrain is contrasted against adorably whimsical style in "My Life as a Zucchini," the lovely stop motion animated film that was one of the five stellar Best Animated Feature nominees at this year's Oscars. After the death of his alcoholic mother, a shy, young boy named Icare (he prefers to go by "Zucchini," the nickname given to him by his mom) is sent to live in a group home. After a rocky start thanks to some "feeling the new kid out" bullying by the home's resident troublemaker, Zucchini gets to know the orphans and misfit children who live there and gradually finds his place among them. Each of the home's children have their own tragic backstories -- from witnessing the murder of a parent to abuse and abandonment -- and one of the film's unspoken underlying themes is the remarkable resilience of children. Thankfully the couple who manage the home are a far cry from the malevolent types we associate with these types of stories, and they seem to take quite good care of their young charges. Along the way, Zucchini sends crayon-illustrated updates to Raymond, the kindhearted policeman who brought him there. "My Life as a Zucchini" boasts some delightful character design; with their big eyes and dark circles underneath, they're reminiscent of some slightly more colorful Tim Burton creations. The film is based on a novel by Gilles Paris, and has the benefit of being adapted for the screen by French filmmaker Céline Sciamma (the director behind the terrific "Tomboy" and "Girlhood," and the co-writer of André Téchiné's "Being 17," which made my list of the best films of 2016). All of Sciamma's films are one way or another about the pains of growing up. She has a gift for capturing the way young people talk, which helps to make every moment ring true. Her script never hammers home its emotions, maintaining a delicate touch over the more troubling aspects of its story. Director Claude Barras never shies away from the challenging material (making "Zucchini" the least kid-friendly of the animation nominees), but that decision allows the story's joy and tenderness to shine that much brighter.